The Rion Hobby green coloured greenhouse is a fantastic choice for the growing enthusiast. 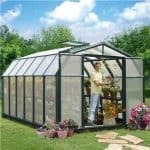 It is a great size which means it is spacious enough to grow plants, vegetables and flowers of varying size. 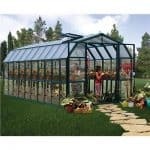 The structure has double doors and is such that it is able to trap heat so you can even grow exotic plants that are not available normally in the UK. 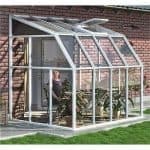 Constructed from 4mm polycarbonate glazing with a thick resin frame and with special UV protection against harmful rays this is a superb product at a very reasonable price. Your plants and vegetables will no doubt flourish and grow.